Fried dough, by any name, would taste as good. 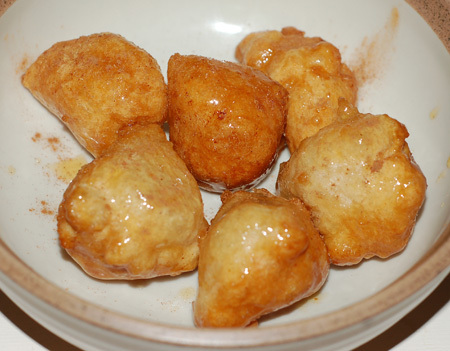 Case in point: loukoumathes, those puffy little yeasted doughnuts—also spelled loukoumades—which, like most Greek desserts, are best served drenched in honey and sprinkled with cinnamon. I made a batch to cap off our streak of Greek meals, using a recipe in The Food and Wine of Greece that contains just four ingredients. It came together easily, although I think I should have made it looser, less like wet bread dough and more like thick pancake batter. After 2 hours of rising time, I heated up my 10″ cast iron skillet with an inch or so of oil and used my smallest disher (about 2 teaspoons) to scoop blobs of dough into the hot oil. This dough was so sticky that I had to keep a butter knife in the other hand to help it release fully from the disher. I sprinkled the freshly cooked loukoumathes with cinnamon and ended up with a huge pile of fried dough, more than we could possibly eat in one or even two sittings. I warmed enough honey syrup to toss over about a dozen of the treats in a large bowl with a bit more cinnamon, and we all shared them with sticky cheeks and fingers. 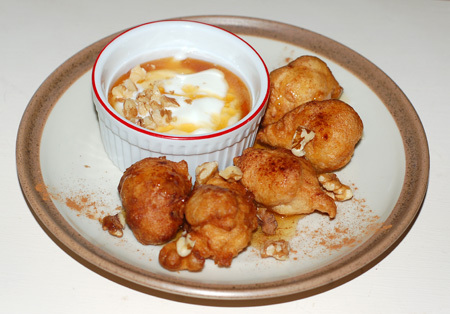 These loukoumathes ended up on the chewy side, which is why I think my batter was too stiff, but they were still a yummy way to top off our dolmades, and we enjoyed more for breakfast the next morning, with fresh drizzles of honey, chopped walnuts, and a dish of my homemade yogurt for some balance. Mix together flour and salt in the bowl of a stand mixer. Dissolve the yeast in 1/2 C of warm water. Using the paddle attachment, stir the yeast and water into the flour, adding more water to obtain a thick batter than falls off the end of a spoon. Cover and allow to rest in a warm spot for two hours, until doubled in size. Heat about an inch of vegetable oil in a heavy pot or cast iron skillet, to the temperature of 360-365F. Drop teaspoons of batter into the hot oil and cook until golden brown all over. Remove from oil and drain on paper towels; sprinkle with cinnamon and douse or drizzle with warmed honey while still hot. Source: The Food and Wine of Greece , by Diane Kochilas (p. 310). its hard to go wrong with fried dough!! yours do look wonderful and serving them with the yogurt was a great idea!